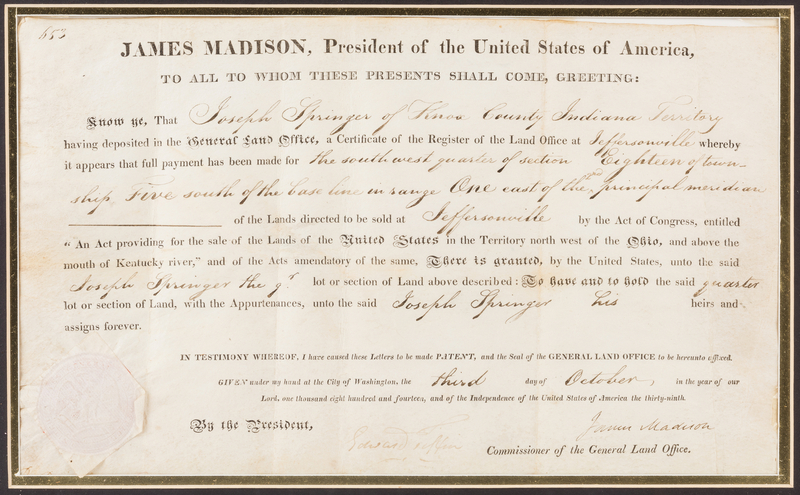 President James Madison (1751-1836) signed land document, granting Joseph Springer of Knox County Indiana Territory (now part of Illinois) "the southwest quarter of section Eighteen of township Five south of the base line in range One east of the 2nd principal meridian of the Lands directed to be sold at Jeffersonville by the Act of Congress, entitled 'An Act providing for the sale of the Lands of the United States in the Territory north west of the Ohio, and above the mouth of the Kentucky river'", dated October 3, 1814. 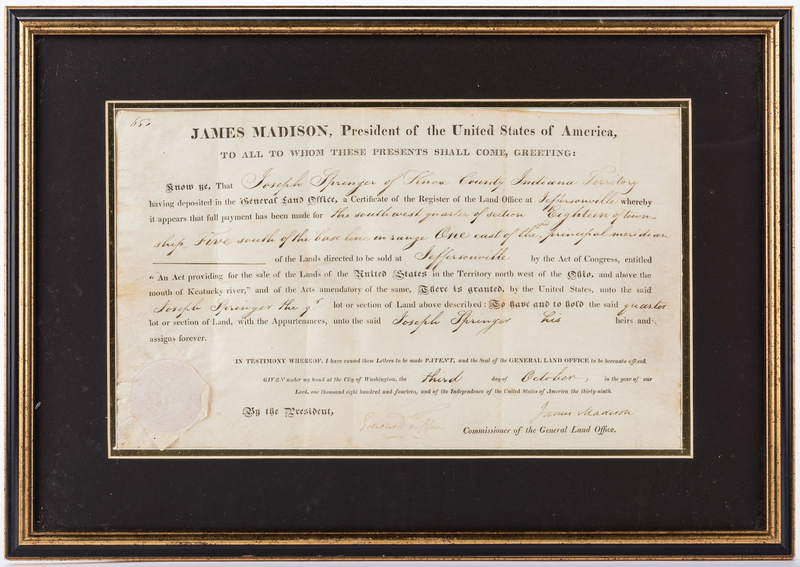 Housed under glass in a black and gilt painted wood frame. Sheet – 8 1/4" H x 13 1/2" W. Framed – 13" H x 18 1/2" W. Provenance: Estate of Lynn Scholl Renau, Louisville, Kentucky. Biography: "Joseph Springer was a captain of the The Twelfth Regiment of the The First Brigade of the Indiana Territory during the War of 1812. 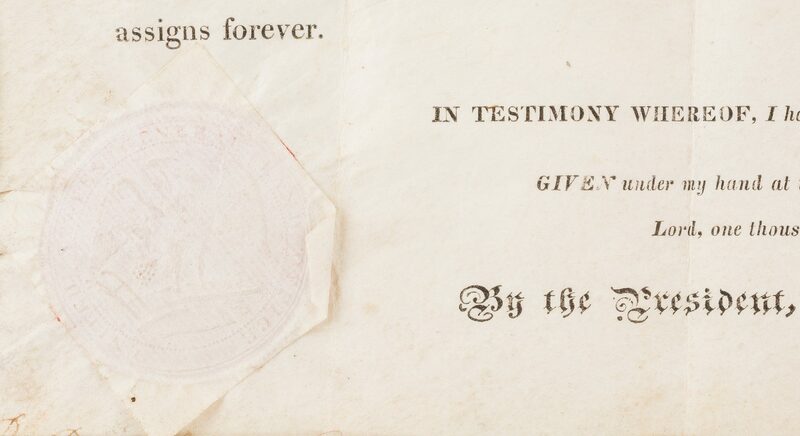 He received his commission on March 14, 1816, one of the few commissions issued before the State government commenced". (Information according to http://genealogytrails.com/ind/warof1812.html). CONDITION: Overall good condition with areas of toning and scuffs to be expected from age. "J" of signature slightly faded, otherwise in strong, clear condition. Black ink spots, largest 3/8", en verso of sheet. 1/4" area of distortion of glass, lower right center.